Recommended when installing your floor heating system over a concrete slab to create a thermal break and increase the energy efficiency of the system. Ask your account manager for more details. 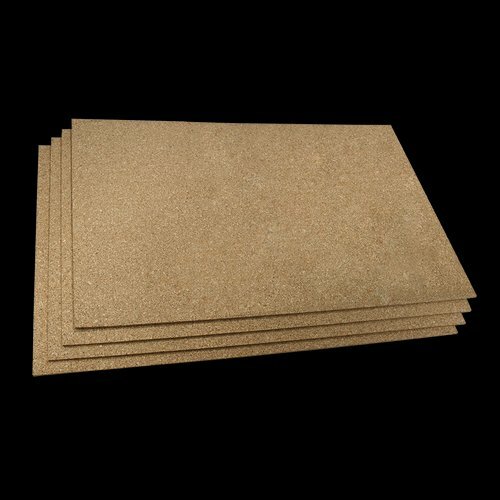 Are all Cork Underlayment products the same? Not really. Properties such as density, particle size and consistency of particle size are very important and vary widely from one manufacturer to another. Density affects the structural stability of the product and the sound attenuation quality. A product that lacks density will be too delicate to use as an underlayment and a product that is too dense will have poor sound attenuation characteristics. A product that has too large of particle size or a wide range of particle sizes in the mix will lack the structural integrity to be effectively used as an underlayment. Will cork support the growth of mold and mildew if used in a moist environment? Cork does not readily support the growth of molds and other biological agents. Additionally, the granules of Cork used to make AcoustiCORK products are coated with a polyurethane binder, which enhances their natural microbial resistance. Will cork compress and crumble under heavy loads and traffic? Unlike open or even close-celled synthetic foam materials, cork consists of an interlocking structure of 14-sided polygons called tetracadecahedrons. These totally sealed gas filled cells have a very tough outer surface that is almost impossible to break. Because of this unique natural attribute, cork has a compression/recovery rating of close to 100%. Unlike many foam and fiber based products, it will not collapse over time with traffic. The binders used to adhere the granules of AcoustiCORK products together are designed to create a permanent structural bond between the particles. Will cork “swell” with exposure to moisture and cause finish floor coverings to fail? Cork will not swell, because cork absorbs so little water, it is very dimensionally stable. When exposed to 100% Relative Humidity conditions for 30 days the dimensional change in the grade of materials used to manufacture AcoustiCORK products is less than 3%. In a 6mm thick piece of material this would represent an increase in thickness of less than 1/120 of an inch. Will composition cork material fall apart if it gets wet after it has been installed? No, that may have been the case over 20 years ago when animal protein binders were used, but not anymore. Since the early 1980’s non-water-soluble polyurethane binders have been used to adhere the granules together to make Amorim composition cork products. These polyurethane binders also produce no post installation off gassing and do not leech into ground water supplies. AcoustiCORK products can be totally immersed in water for 30 days or more and show no signs of structural deterioration. Will cork absorb water if it gets wet? The short answer is "no." Think of the most common use for cork, wine stoppers. Cork has been used for wine stoppers for hundreds of year primarily because it does not absorb water or liquids. Cork has also been used for years in buoys, lifejackets and other floatation devices, again because it does not absorb water and can remain buoyant for years. A cubic inch of solid cork immersed in water for 48 hours will gain less than 3% in weight due to water absorption. A cubic inch of solid wood or unglazed clay-bodied ceramic tile would gain many more times this percentage in weight of water if immersed for 48 hours. Cork Underlayment achieved an average rating of 4.9 stars with 7 reviews by our customers. The sheets were just the right size for DIY. In hindsight, because the floor mats had the flat cable assembly, I could have safely gone with the Cerazorb instead. (increased R-value). Anyway, the cork provides a nice stable base for the mats and the hardwood floating floor. Pleased with the product and even more with your helpful service. Great doing business with you. I applied the cork on the wall behind my new refrigerator, using it as a sound absorber. I really don't have a before and after comparison, but just enjoy knowing that I made an effort to dampen the sound and found the product easy to cut and affix to the wall. The 1/4 inch thickness was satisfactory. Thanks for guiding me to finding and purchasing the underlayment. It's exactly what I was looking for. By the way, I have the same material on the wall behind my desk, and it makes a great bulletin board. I'm happy to have done business with you. It was easy to install. I placed it in position the night before the carpet guys were showing up to install the carpet. The installation process overall was flawless. This was extremely easy to use. We just laid it out, cut to fit, and glued it down. No problems. I want to thank Mary and WarmlyYours for making our first purchase of heated flooring products a complete success. A class act all the way, from web page to finish product. I applaud your professional and courteous attitude. You definitely have a good thing going. Keep up the good work and I look forward to working with you guys again.